The world’s first cinema poster sold for a record £160,000 at Sotheby’s online-only sale of Original Film Posters. Cinématographe Lumière’ sold for over 2.5 times the pre-sale high estimate of £40,000-60,000. It has been in a private French collection for over 40 years. It was designed by French artist Henri Brispot in 1896, to promote the first ever film to be publicly screened: a series of short clips about everyday life in 19th century France, created by the Lumière brothers. The first ever screening had taken place at The Grand Café in Paris on December 28, 1895. Within days, the film was a sensation. 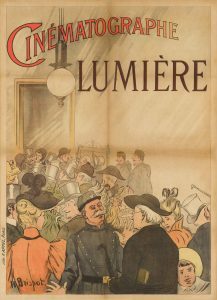 The poster was created amidst the excitement which followed the initial screening, and shows crowds jostling to enter the Grand Café. The screening at the Salon Indien of the Grand Cafe, on Boulevard des Capucines in Paris was a humble event, with an audience of less than thirty people. It lasted approximately twenty minutes but marked the public beginning of one of the most important cultural, artistic and social phenomena of the 20th century. Victor Perrot, who witnessed the event, writes about that winter evening in various articles and memoirs, calling it a ‘great historical first’. This is a new record for a film poster sold by Sotheby’s, previously set at £42,000 in September 2017 by King Kong.